At KSS, we build for success. We believe that environments can fundamentally alter the behavior of individuals with ASD, and that, all too often, individuals find themselves struggling against the parameters of a space. Building ASD-friendly environments has become part of our vocabulary. We are advocates—in defining leading-edge frameworks for building for individuals with ASD at Eden’s Princeton campus, our design team lobbied for codes that would allow smaller, more comfortable therapy spaces. We are researchers—our inquiry into authentic innovation for ASD-friendly building spans the psychology of walking loops to technical aspects of acoustics and lighting. We are participants—our process is an arc that bends toward collective, interactive design of environments to support institutes, individuals, and purpose. We are well-versed in national research that defines the front edge of building for individuals with ASD. We have adapted strategies from the authoritative Arizona State University report, Advancing Full Spectrum Housing, and regularly incorporate lessons learned from nationally renowned projects such as Sweetwater Spectrum, Hillside House, First Place Arizona and The Center for Discovery. Through extensive research and project experience, we have developed an architectural response to Universal Design that supports the full learning potential for individuals with ASD on their journey to live independent and fulfilling lives. 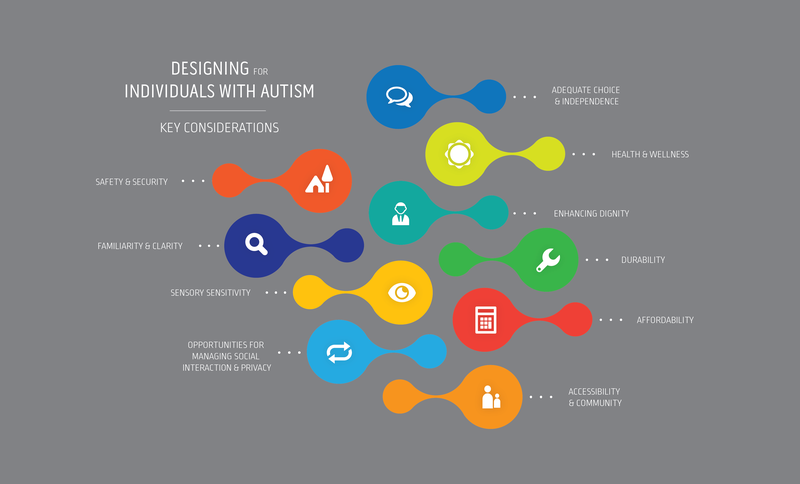 Learn more about our holistic approach to designing for individuals with ASD with the below infographic.